I’ve tried many facets of amateur radio including working through ‘repeaters in the sky’, or as they’re more commonly known, satellites. 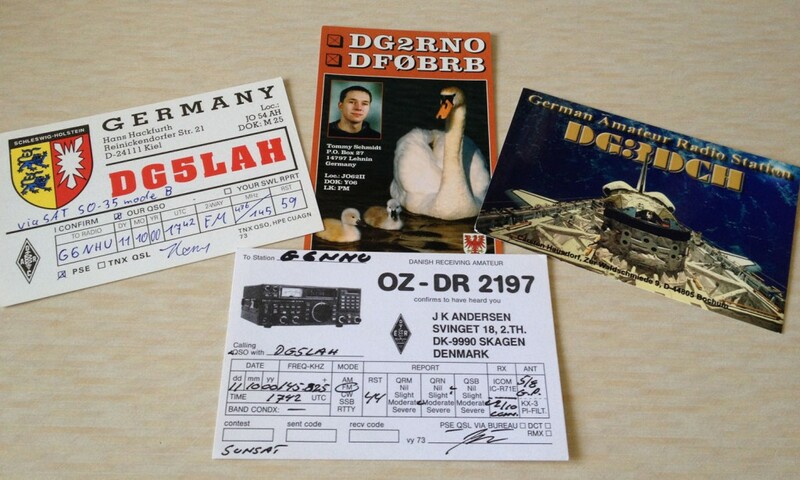 I recently dug out an envelope of old QSL cards and in amongst them were four cards back from 2000 where I had QSOs through the now long defunct SO-35 ‘Sunsat‘. Three of the cards are from stations I worked and one is from an SWL. It’s very refreshing to see the amount of information on the SWL card, I’ve not received any other SWL report with as much detail. My log only shows six QSLs for the whole of 2000, five of those were satellite so it clearly wasn’t one of my busier years of operating amateur radio and I’m not sure what radio(s) I would have been using but I know the aerial was a Diamond X500 colinear. This entry was posted in Amateur radio, FM. Bookmark the permalink.